Number of cards in deck: 79. See comments below. Measurements: 3.5 x 5 inches, or 88 x 127 mm. Large. Booklet included: Yes, small, 3.55 x 5 inches, or 90 x 127 mm, 54 pages. Not illustrated. Publisher: Inspire by Design, Newport News, VA. Copyright by the artist, Allen Chester. Artist Allen Chester has tapped into the wisdom of these mystical knights through his art. 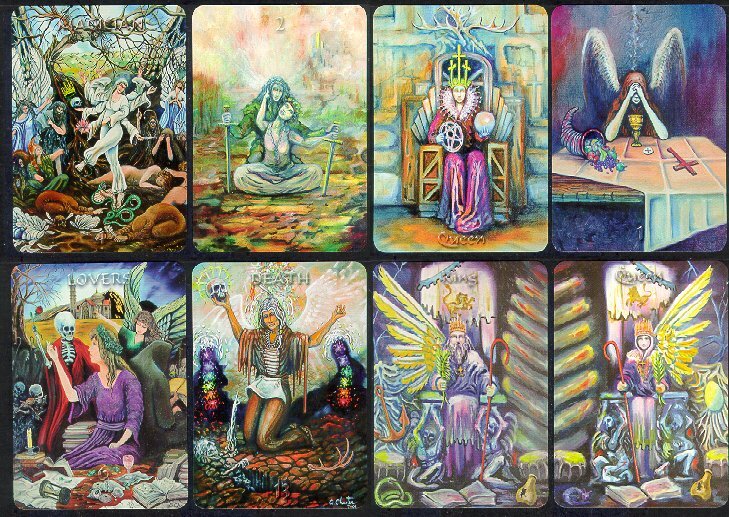 The project took five years to complete and concluded with an additional Major Arcana card representing the secret that can be revealed through meditation. Each painting is influenced by a higher consciousness. As you meditate on the art, you may also tap into that realm of consciousness that holds the Secrets of the Universe. The cards were designed without borders so that the reader can remain limitless while delving into the esoteric meaning held within each work of art. The booklet offers a divinatory and reverse meaning of the symbols on each card. Daria Kelleher, the author of the accompanying book, has, by strange coincidence (pg 53) actually studied the Knights Templar. Wish the artist had. According to Daria, there is a persistent belief (pg. 1) that tarot was invented by the Knights Templar, but she presents no evidence to support the belief. What was originally known as The Order of the Poor Knights of Christ was founded in 1118 in Jerusalem when 9 French knights presented themselves to King Baldwin, of the First Crusade. In 1307, they were destroyed by King Philippe IV of France. Due to the lack of hard information about the Knights Templars, many myths have arisen about them. We may say they were rich & powerful. What else they may have been can only be judged by their surviving artifacts. Here is the curse of modern times: Few know how to read them. The inability of most tarot artists to produce convincing decks underscores my point. The Magician dances a jig among merrymakers. The Lovers shows a woman choosing Knowledge of Death. Behind her a monk sits, ignored. Death is doing some strange ritual where the dead (a skull) are used to raise the dead - who remain dead. Face cards & major arcana cards have their title printed, sometimes at the top, sometimes on the bottom, in ghostly printing. Pip cards are numbered. These titles are not as clear on the cards as they appear in the graphic above. The artist used oils as his media. In my opinion, oil is unsuitable for a tarot deck. See the Golden Rider Tarot deck for another example of an oil deck. Watercolors do much better. Page of Swords: Warriors of the Bloodline. Page of Staves: Keepers of the Secret. Page of Cups: The Bloodline. Page of Pentacles: The future of the Bloodline. There is an awful lot of death & blood in this deck. These always bear the stamp of magic, and not such a very good sort of magic at that. "Staves", as shown in this deck, are actually Bishops' Crosiers, which were derived from the hooked staffs of sheepherders. They have great symbolic significance, but this seems to have escaped the notice of both artist & author. There is a Glossary that rambles on. Many entries have nothing to do with the Templars, such as those for Alchemy, Arians, Bloodline, Cathars, Childerick I, Dagobert II, Dualism, King Arthur, Perceval, etc. The Extra Card: Ah, yes. The card itself is untitled, in the book it's known as The Magic Flute. A winged Piper plays and dances through a lush landscape, oblivious to the surroundings. On the right ankle is a fetter with a broken chain. The glow of the night's moon is reflected while at the same time the sun is starting to rise. Divinatory Meaning: This card is not explained but its meaning can be revealed through meditation. The Magic Flute is, of course, an opera by Mozart. In it, Mozart, himself a Mason, reveals some of the secrets of the Freemasons. They were understandably upset with him. There are said to be links between Templars & Masons.